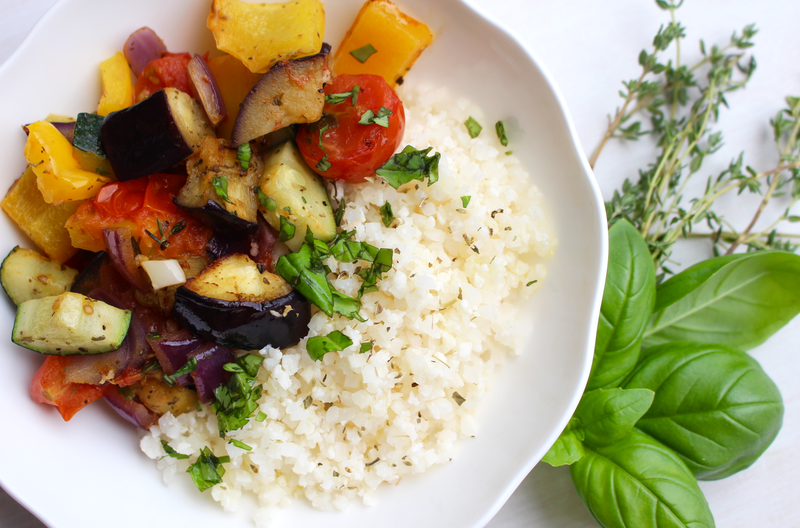 This roasted mediterranean vegetable and cauliflower rice dish is so simple but so amazing! It’s super quick, easy, inexpensive and most of all delicious. 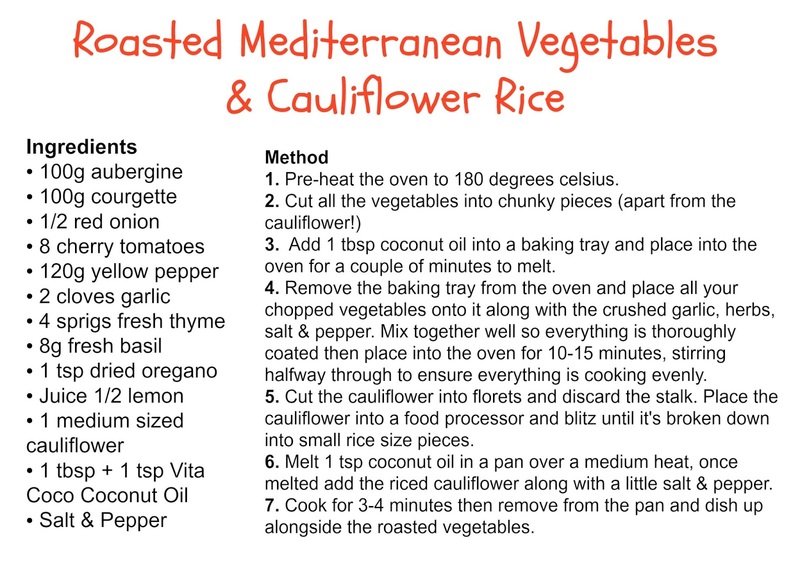 The cauliflower rice makes a great option if you want a light meal but you can substitute it for brown rice if you would like a heartier, more filling meal. These flavours and textures are truly mouth-watering! 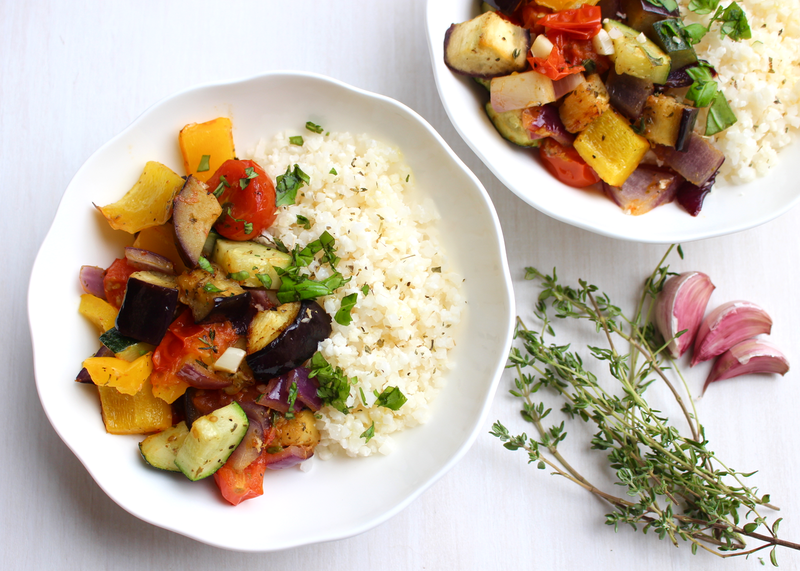 I love the fresh taste of thyme and basil mixed with zesty lemon and perfectly roasted vegetables. Every bite like heaven and I can just feel all the plant-based goodness nourishing my body. There’s loads of fibre from all the veggies to promote healthy digestion and a huge array of vitamins! Courgette and pepper provide you with vitamin C for a strong immune system and there’s lots of antioxidants in them too! Aubergine doesn’t just taste good and soak up all the flavours it’s cooked in but it also contains B&C vitamins, magnesium and manganese to promote a healthy body. Everything in this dish will do wonders for your body with powers to lower blood pressure, reduce your risk of heart disease, give you a load of antioxidants, promote eye health and do your liver, kidneys and bones good too! 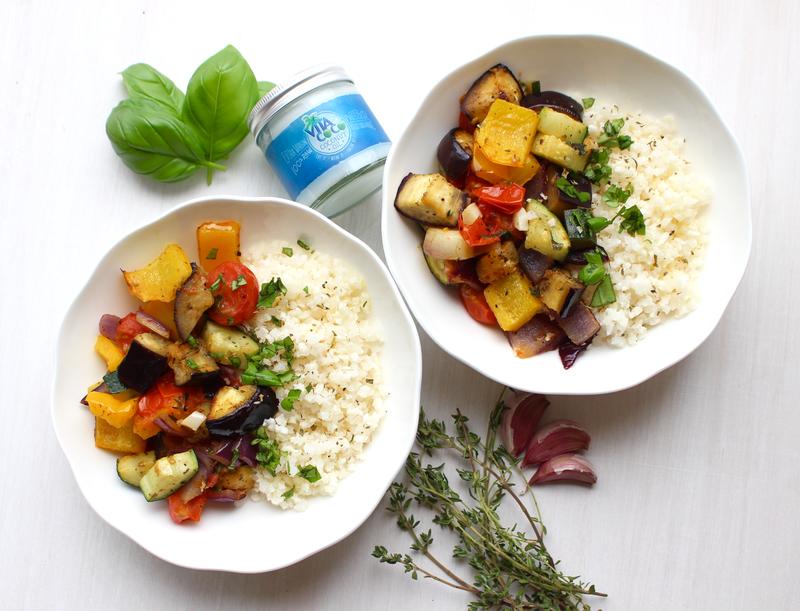 Everything is cooked in Vita Coco Coconut Oil which is one of the best sources of healthy fats out there! People are often scared of fats but they’re an essential part of the human diet - they’re needed for steady energy levels, healthy hair, glowing skin, a strong immune system, cell health and they’re really important for brain health too….a true happiness booster! Coconut oil is a form of saturated fat, which we’re often told to avoid, but the saturated fat in coconut is actually of a different structure and metabolises in the body differently. Coconut oil contains medium-chain fatty acids which only go through a 3 step process to be turned into fuel (as apposed to the 26 step process many other fats go through! ), this makes them easier to digest and means they’re not readily stored as fat in the body. These healthy fats have been shown to prevent heart-disease, lower blood pressure, reduce inflammation in the body, improve your memory and even boost the metabolism. Adding raw, unprocessed coconut oil from Vita Coco to your meals is such an easy and delicious way to do your body good and load up on superfood power. Check out the other recipe I created for Vita Coco here, it's a delicious broccoli & cashew stir fry!